Time to give those nasty trolls what for. Your favorite Skylanders figures come to life in Activision's newest iPhone and iPad release, Skylanders Battlegrounds, a portable adventure that lets you control two characters at once as you attempt to stop the evil Kaos and his warlord army from reigning havoc across the land. Who you bring into battle and the choices you make will result in victory or defeat. We prefer to win, which is why we conjured this Skylanders Battlegrounds cheats and tips guide. Each time you move the lead Skylander across the grid, enemies shift position. By studying their movement patterns, you can avoid most encounters altogether. This may prove useful if you're low on health potions. Here's the thing. Each time you defeat some bad guys, the game awards XP, AKA experience points. The more of these you have, the higher levels you'll obtain. This is key to beating Skylanders Battlegrounds, because you need to be a certain level to challenge tougher opponents. Avoiding battles is OK sometimes, but more often than not, you should stand up and fight. Before heading into battle, click the Item Shop button on the lower right. This brings up a variety of Portal Master Powers, which function as power-ups in the game. Here, you'll find health potions, anvils to drop on enemies' heads, dynamite, bombs and even a damage booster, among other useful things. Always a great a idea to have some of these on hand, health potions in particular. You will receive a coin bonus each new day you play Skylanders Battlegrounds, but first, you must equip a character that matches the Element of the day. To check the day's Element, press the icon on the top right portion of the screen, then match the symbol with the correct Skylander. You can switch Skylanders by pressing one of the character images on the lower left. While exploring a stage, the game only displays one Skylander, the leader. If you grow tired of seeing the same old character, you can easily change it by pressing that Skylander's icon on the lower left. From there, find the Skylander you want, press the Assign button and then tap the + symbol in the Leader box. You can also cycle between the two current Skylanders if you want the other to assume the Leader role. It's easy to leave your Skylanders in one spot and just pelt enemies with ranged attacks, though doing this isn't necessarily the best idea. Some bad guys fire projectiles that will cause a ton of damage unless you move your characters out of harm's way. 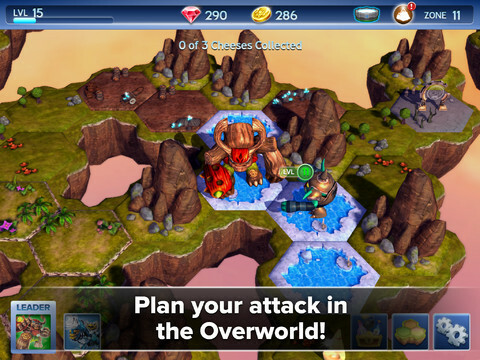 Just tap the Skylander and drag a finger to some other location, and the creature will automatically move to that spot. The last thing you need is for a Skylander to fall in battle. With this in mind, watch both health bars to make sure they're green. Yellow? It's time to use a health potion. Each Skylander has two special abilities. Some unleash powerful attacks, while others heal both characters. It costs both Gems and Coins to unlock them all, but it's worth it if you aim to beat stronger bad guys. To get the most out of Skylanders Battlegrounds, you may need to purchase more Gems and Coins, which you can do while exploring a level. Keep in mind that you cannot buy Coins with cash. Instead, you must use Gems. How do I pair my Bluetooth Portal of Power with my iOS device? Make sure the Bluetooth Portal of Power is turned on. Make sure Bluetooth on the device you want to use is enabled by tapping on Settings -> General -> Bluetooth and turning Bluetooth on. Press the Bluetooth sync button on the bottom of the Portal of Power (the status LED will blink rapidly). Why did my Portal turn off? If the Portal of Power is not used for 3 minutes, it will enter sleep mode. Press the Power button to turn ON the Portal of Power again. How do I turn my Portal of Power off? Press and hold the power button (located on the side of the Portal) for one second. Gems can be earned by winning battles, unlocking blue Treasure Chests, or leveling up. You may also purchase gems via the Gem Store. How do I unlock Skylanders? Skylanders can be purchased with gems, as well as unlocked with your toy collection. If you have Skylanders toys, you can unlock them via the Bluetooth Portal of Power (included in the Skylanders Battlegrounds Mobile Starter Pack) or by entering in your Secret Code on the Skylander's Bio screen. Go beat up some more bad guys! You can also get coins from Treasure Chests and the Coin Store. Your game is saved automatically after each battle, as well as after any activity in the Overworld. I have beaten Mega Chompulon, how do I unlock the next boss? Check back often, we're constantly updating and add new things. We'll add more levels and bosses soon! What happens if my Skylander is defeated in battle? If your Skylander is defeated in battle, he is unable to come back to that same battle. Your Skylander will return to full health and be ready for battle as soon as you leave the current battle. To replace your fallen Skylander with another during battle, place another Skylander on the Portal of Power or tap the button that says "Call in Support!" Can I use Legendary models at the same time as the regular toys? Yes! Legendary Skylanders are separate from their regular counterparts. You may use both at the same time. How can I get Royal Double Trouble? Royal Double Trouble is exclusively available in a special version of the Skylanders Battlegrounds Mobile Starter Pack. You can find this special version in select stores, such as (need retailer info). You can also unlock Royal Double Trouble at any time with your gems. Why are some treasure chests blue and others brown? A Blue Treasure Chest is a special Treasure Chest that contains gems. Fight your way to it and open it up to claim the gem rewards!